I know it has been awhile since I have posted anything but I had to deal with some health issues. Thankfully, I have found a doctor willing to listen to his patients. I am on medication and a diet to control blood pressure, tremors, and to kickstart my thyroid. Plus, my husband has been working over in Bear Lake so we’ve been on several mini-vacations. Currently, my health is improving. However, I just found out that my father was admitted to the VA hospital in Salt Lake City, Utah and might go in for heart surgery within a week. My fingers are crossed. Anyway, let me show you what I’ve been working on the last couple of weeks. It is called The Musician and it is by Joan Elliott. It is in a series of three with The Reader which I have already done and The Gardner which is in my stitch stash waiting patiently. As you can see, I have accomplished quite a bit. 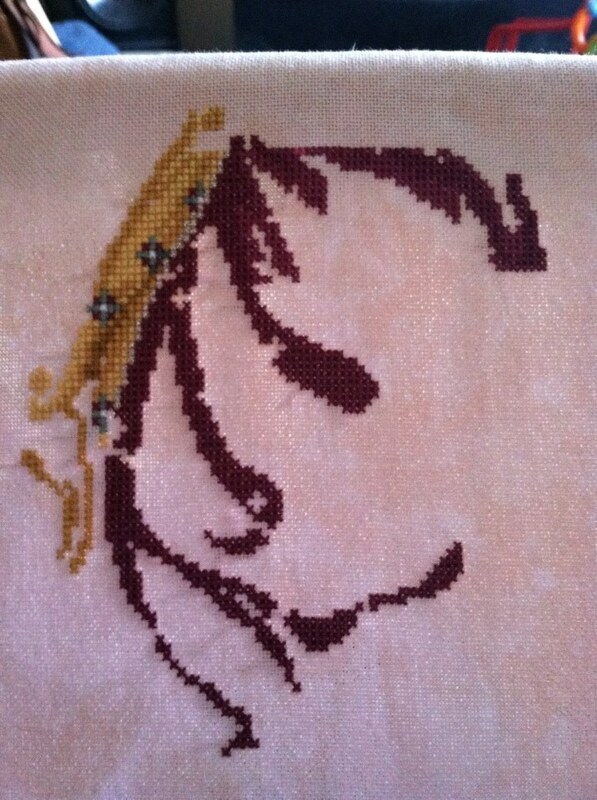 That’s it for now, Happy Stitching! 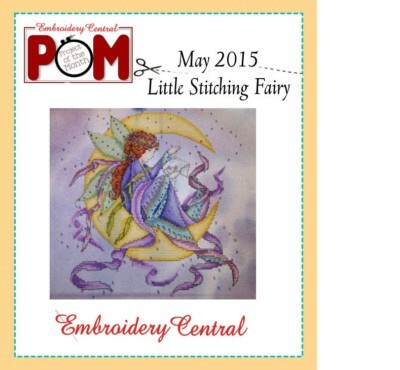 For May, Embroidery Central has chosen a design from the one and only Joan Elliott called The Little Stitcher. It costs $32.99 and comes with your choice of hand dyed fabric. The price is for the pattern and fabric only but while you are ordering this why not order the threads too so you can get started right away. Now, if you have a mom or grandma who stitch, this would be an awesome gift to send to them for Mother’s Day. That is a great big hint to my children and husband. Don’t forget that Embroidery Central still has their Spring Cleaning sale going on with up to 80% off of patterns. You can buy the POM and grab a few more goodies to go into your stash. Happy Stitching! 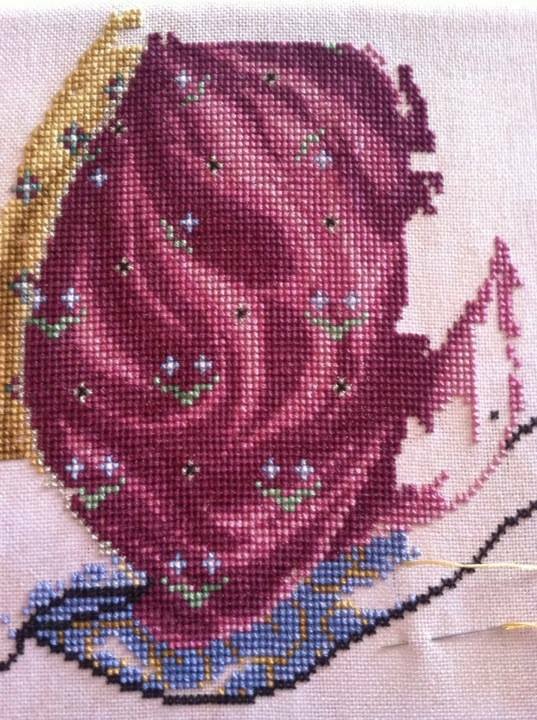 Yesterday was WIP Wednesday for almost every stitcher around the world and I missed it. I spent Wednesday night trying to find my dog that had escaped out of a fenced in back yard. My body decided it needed sleep and slept through Wednesday. Anyway, here is my progress picture. I started it awhile ago and this is as far as I have gotten. 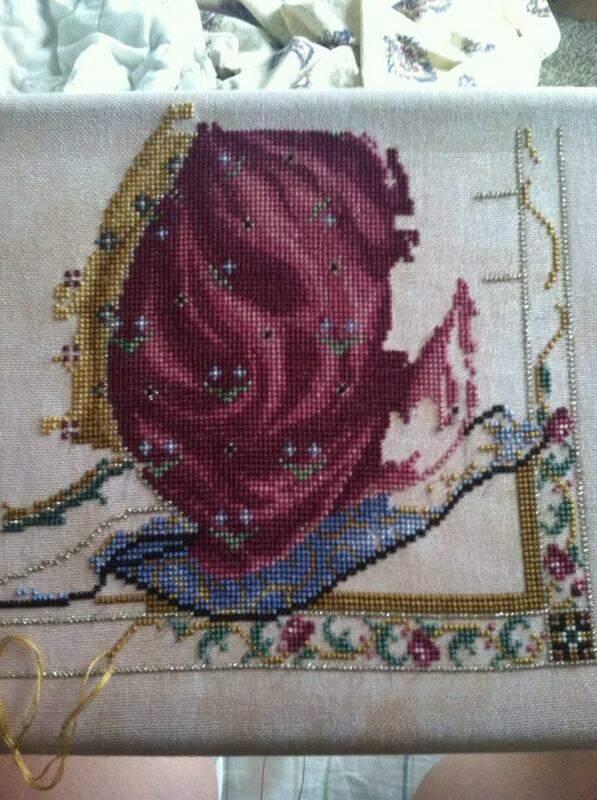 It is a Joan Elliott design called The Musician. You can Google it to see what it will look like. It is an a hand dyed orange fabric that I purchased from Embroidery Central but I am not sure what it is called. If I find out or remember, I will let you know. Now, I just have to decide if I want to clean, stitch, or write.